For the most part, my photography routine works well. Crop to size. Adjust color to as close to the bead as I can using levels. Resize to 1000 px square, and run unsharp mask. But sometimes that routine just doesn't work. Since I have been procrastinating doing some work for my day job, I have been searching out GIMP tutorials to share. One of the simplest is a lovely video tutorial on creating a graduated ND filter, which enriches the colors of your photo when they are washed out. Here is my original picture. Not bad, but not great, either. Well, let me say that this isn't really the original--I've already cropped the picture to zoom in close. Otherwise, though, I haven't done anything to the image. Next, I went ahead and changed the colors using the Color --> Levels command. This command lets you adjust the color levels using a histogram, and lets you fiddle with the colors until they more closely approximate the colors in your original beads. I used to use the automatic white balance eyedropper, but now I just use the slider bars in the histogram (it opens up when you click Colors -->Levels) until the colors look natural. Only some times they don't. I've found there's lots of ways to make the colors pop, but one of the simplest is to add an ND-Filter. The tutorial creator does a good job of explaining how to do this, so I will just add my results here. However, if you have trouble following the video, let me know and I can walk you through it. Try it and see if it helps your photos! What that means is that this week, in and around prepping a new class, I am assessing my inventory and filling in gaps--colors, shapes, types. I'm also moving old bead sets that haven't moved through two or three shows to the "super sale" bin. I'm concentrating on simple beads in spring colors -- frit beads that I can put a lower price on than I can the beads with a lot of complex elements. Given the current economy, I want to have a number of affordable options. Plus the current focus on simplicity means that beads that are not fussy may do well. I have enough fancy focals that there should be something for everyone. I'm also changing some of my display. I started out showing all sets on mandrels in the cigar boxes. Then I went to wiring the sets together and leaving them loose in the boxes, spread out so they could be seen. There are advantages and disadvantages to both approaches. The advantage of wiring sets together is that you can combine shapes and sizes, and the wired form seems to invite more handling. People who can afford a whole set are more likely to buy the whole set. The disadvantage is that people who might want one or two beads but not the whole set tend not to want to disrupt a set, and don't buy anything; and there are some people who think that the beads are already wired into their final form, and cannot imagine what to to with that form. The boxes also take longer to set up. The advantage of having the beads neatly on mandrels in rows is that per-bead pricing is more obvious, and people on budgets are more likely to buy a couple, even when they cannot buy the whole set. Setting out the display takes less time--just open the cigar box, arrange, and you are done! The disadvantage is that the mandrels seem to invite less handling, and it is harder to show prices per set and per bead. I think I am going to combine my display, depending on the type of bead. Elaborate, elegant, higher priced sets (or sets with multiple sizes of beads) I will leave wired together, loose in the boxes. 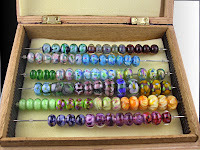 Frit beads, however, where everything is one or two sizes, I plan to show in the boxes, on mandrels. I will continue to display focals in trays or cigar boxes with the grey square inserts. I'm hoping that this arrangement will make clear price differentials, as well as encouraging sales in a slow economy. One hopeful sign comes from Melanie Gulley at the Bead Shoppe, who says her sales continue to be constant -- people may not be able to afford the finished goods, but making something themselves is seen as a good, frugal bargain.